Lyneham High School students Charli, Tabitha and Sofia attending the inaugural Women in Engineering and Computer Sciences (WINGS) event last Thursday at Hawker College. More than 100 female Year 9 and 10 students from across Canberra visited Hawker College last Thursday for the inaugural Women in Engineering and Computer Sciences (WINGS) event. 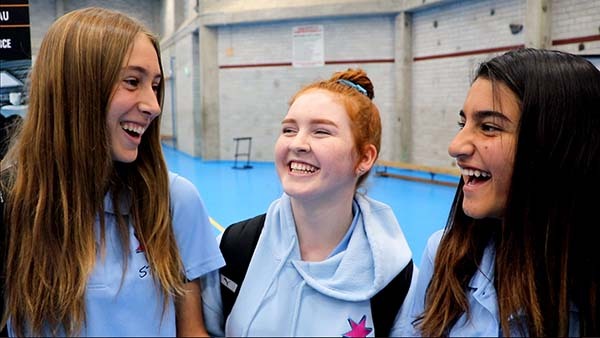 The WINGS event saw female students from Hawker College, Belconnen High School, Canberra High School, Campbell High School, Kingsford Smith School and Lyneham High School attend. WINGS showcased science, technology, engineering and mathematics (STEM) careers in the form of hands-on sessions, panel discussions and an expo. Women are traditionally underrepresented in the engineering and computer science fields, so events like WINGS have a role to play in inspiring young women to consider learning and working in these fields. The students took the opportunity to engage in hands-on learning, network with like-minded students and industry representatives, and participate in discussion about issues, pathways and careers for women in STEM. The workshops and forums featured women from Robogals, an international student-run organisation that aims to increase female participation in STEM careers, and Engineers Without Borders, a community organisation mobilising engineering skills and understanding to ensure everyone has access to essential services and infrastructure. Larger organisations - like IBM, the Australian National University, University of Canberra and the Australian Defence Force Academy - were also present to talk to female students about engineering and computer sciences and potential careers in those fields. Students said the event had been a good insight into potential future careers in STEM. Lyneham High student Tabitha agreed.